In a dress rehearsal for the rendezvous between NASA's Deep Impact spacecraft and comet 9P/Tempel 1, the Hubble Space Telescope captured dramatic images of a new jet of dust streaming from the icy comet. The images are a reminder that Tempel 1's icy nucleus, roughly the size of central Paris, is dynamic and volatile. 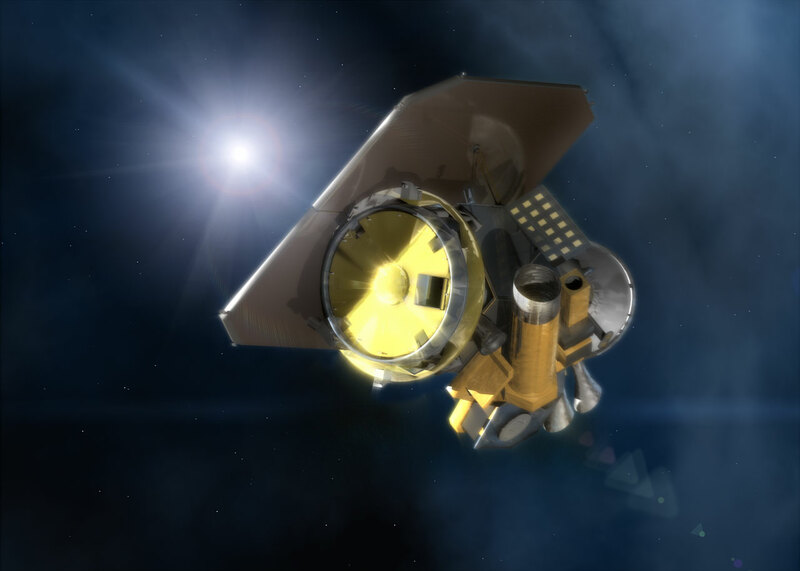 Astronomers hope the eruption of dust seen in these observations is a preview of the fireworks that may come 4 July, when a probe from the Deep Impact spacecraft will slam into the comet, possibly blasting off material and giving rise to a similar dust plume. These observations demonstrate that Hubble's sharp "eye" can see exquisite details of the comet's temperamental activities. The Earth-orbiting observatory was 120 million kilometres away from the comet when these images were taken by the Advanced Camera for Surveys' High Resolution Camera. 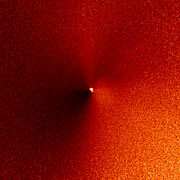 The telescope's views complement close-up images being taken by cameras aboard Deep Impact, which is speeding toward the comet. The two images, taken seven hours apart on 14 June, show Tempel 1 and its new jet. 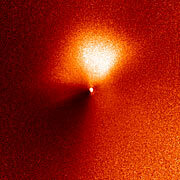 The image at left, taken at 7:17 a.m. (UT), is a view of the comet before the outburst. 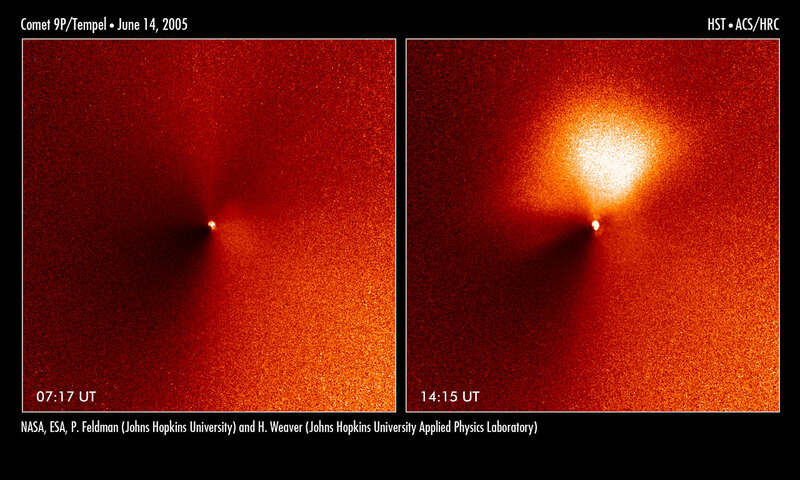 The bright dot is light reflecting from the comet's nucleus, which appears star-like in these images because it is too small even for Hubble to resolve. The nucleus, a potato-shaped object, is 14 kilometres wide and 4 kilometres long. Hubble's viewing the nucleus is as difficult as someone trying to spot a potato in Stockholm from Madrid. The photo at right, snapped at 14:15 a.m. (UT), reveals the jet [the bright fan-shaped area]. The jet extends about 2,200 kilometers, which is roughly the distance from Copenhagen to Athens. It is pointing in the direction of the Sun. 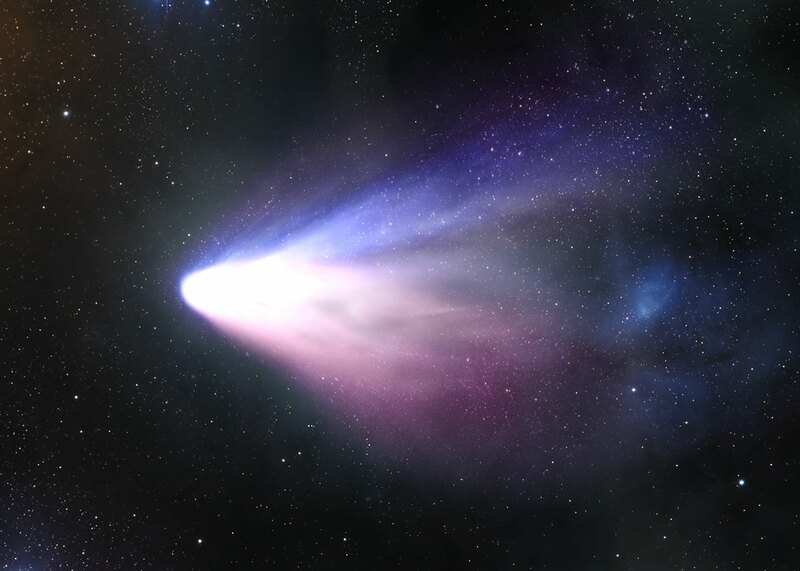 Comets frequently show outbursts in activity, but astronomers still don't know exactly why they occur. 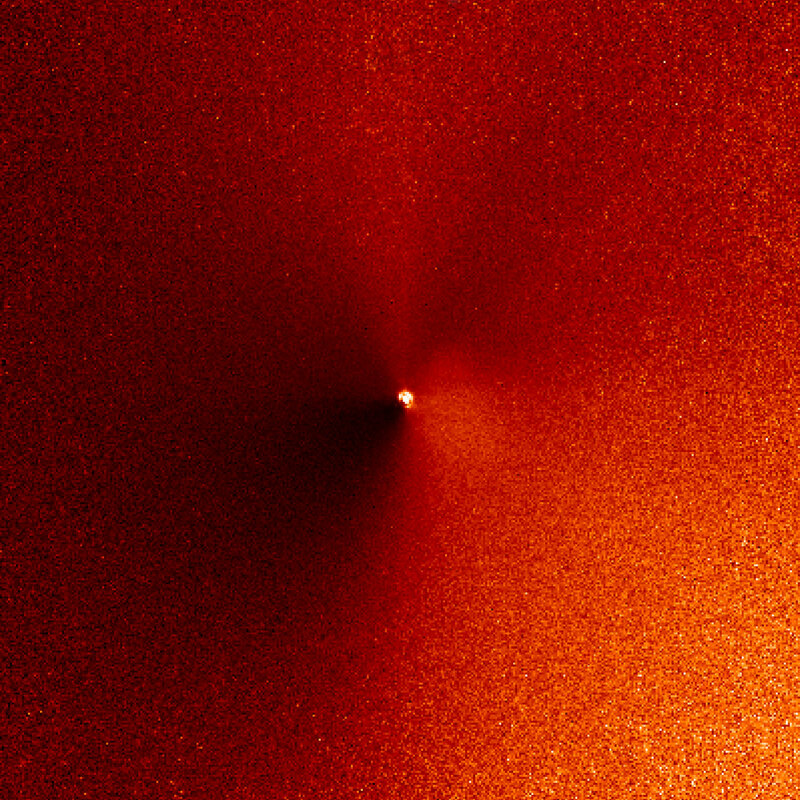 Tempel 1 has been moving closer to the Sun, and perhaps the increasing heat opened up a crack in the comet's dark, crusty surface. Dust and gas trapped beneath the surface could then spew out of the crack, forming a jet. Or, perhaps a portion of the crust itself was lifted off the nucleus by the pressure of heated gases beneath the surface. 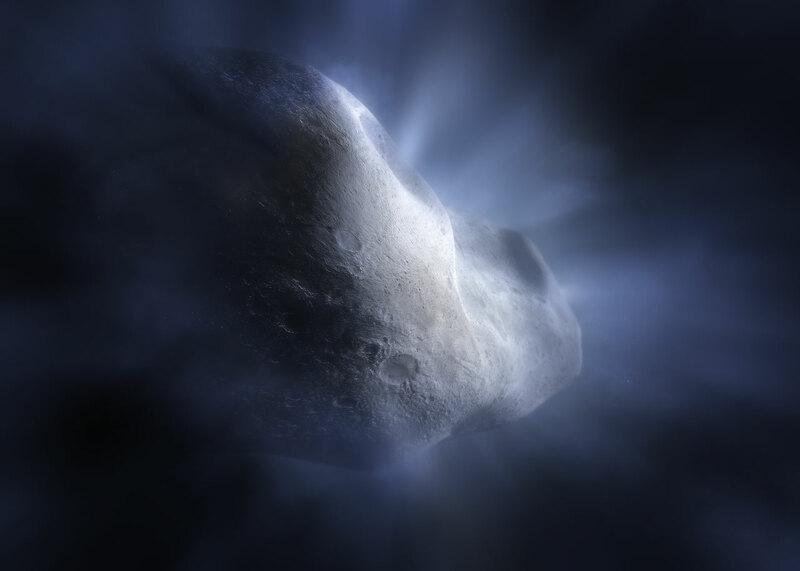 This porous crust might then crumble into small dust particles shortly after leaving the nucleus, producing a fan-shaped coma on the sunward side. Whatever the cause, the new feature may not last for long. Astronomers hope that the July 4 collision will unleash more primordial material trapped inside the comet, which formed billions of years ago. 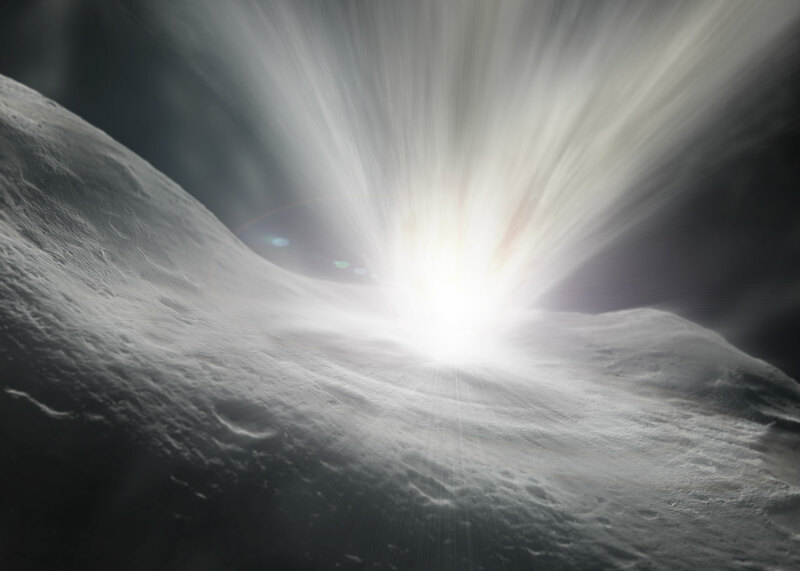 Comets are thought to be 'dirty snowballs', porous agglomerates of ice and rock that dwell in the frigid outer boundaries of our solar system. Periodically, they make their journey into the inner solar system as they loop around the Sun. The contrast in these images has been enhanced to highlight the brightness of the new jet. In Europe, the European Southern Observatory will conduct a massive ground-based observing campaign before and in the week after the impact.